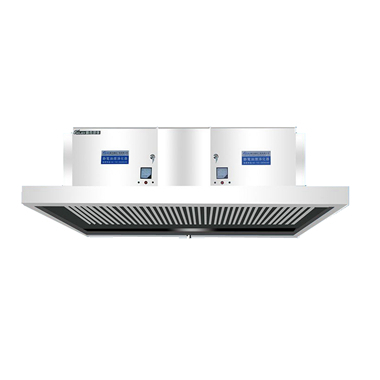 How much does an electrostatic fume purifier cost for catering kitchen? At present, the most popular in the market is the electrostatic fume purifier no doubt , other UV fume odor remover, activated carbon fume filter and other equipment are usually used as an auxiliary equipment for electrostatic fume purifiers. After all, the electrostatic fume purifier is the protagonist. Today, we can tell the answers that many customers wanna know. As you know the most important component of the device is its electric field. Therefore, the most valuable is the electric field. Then? Why is the same electrostatic fume purifier, the same processingCMH capacity, some one sell at $35, $45, and some sell at $350,$450 ? Just see the comparison of the core electric field below and we will know the answer. Back to the topic, how much is a fume purifier ? Since the catering fume emission standards promulgated by first- and second-tier cities all stipulate that the fume purification efficiency of large catering units must reach more than 90%, therefore, a fume purifier with a purification rate of 90% is taken as an example here. Regarding this, some people have some new questions. Why the same 90% purification rate on the market, some are $0.15 / CMH, and some are $0.29 / CMH ? Here,we can figure it out that is,the electric field is different. There are two types of electric fields in electrostatic fume purifiers: plate-type electric field and cylindrical honeycomb electric field. Due to the relatively high consumables, the honeycomb type generally requires much more material than the plate type at the same purification rate, so the price is relatively high. The price of a general honeycomb type fume purifier is 1.5-2 times higher than that of a plate type. The common line-type soot purifier with a 90% purification rate ranges from $0.11 to 0.18 per CMH. To understand the difference between honeycomb and plate-type fume purifiers, please forward to the article: "Which is better ? Aluminum alloy plate structure or cylindrical honeycomb structure?" Some manufacturers, in order to reduce the price and increase competitiveness, reduce equipment costs by reducing consumables and using some low quality accessories. Although the produced fume purifier can have purification rate in a time, it usually cause various quality problems, such as short circuit, easy damage to the accessories, frequent cleaning of the electric field, and short service life of the electric field. Therefore, I would like to warn all consumers that they are not cheap. Buyers need to choose a brand manufacturer with reasonable price and guaranteed service. Gojek has adopted Germany's latest fifth-generation fume treatment technology. After 8 years of continuous innovation and optimization, it has achieved excellent product quality and customer service first. In recent years, it has become one of the top brands of fume purification in China. The electrostatic fume purifier produced by Gojek uses a plate-type electric field. It adopts a 1mm thick aluminum electrode plate and a 6.8mm electrode plate spacing structure design to maximize the use of space distribution and the plate-line electric field. The contact area of the fume is maximized, and the efficiency of the fume purification is increased to the extreme - 98.4%. What equipment is included in a fume purification system? Which is better ? Aluminum alloy plate structure or cylindrical honeycomb structure? The certifications what we must understand before purchase the fume purifier. “GOJEK-Cloud” debuted to monitor the purification of fume in national world for catering users in real time. What is the difference between a cooking fume purifier and an oil mist purifier? Is it the same thing?